I finished Mermaid Azure last Thursday, thus completing my Mermaid Trio. I was so excited to get it finished. She was another sweet stitch and it only took me a day to bead her. So here is how the entire piece looks. I stitched this piece on 16ct Aida Summer Showers by Sunny Dyes fabrics. 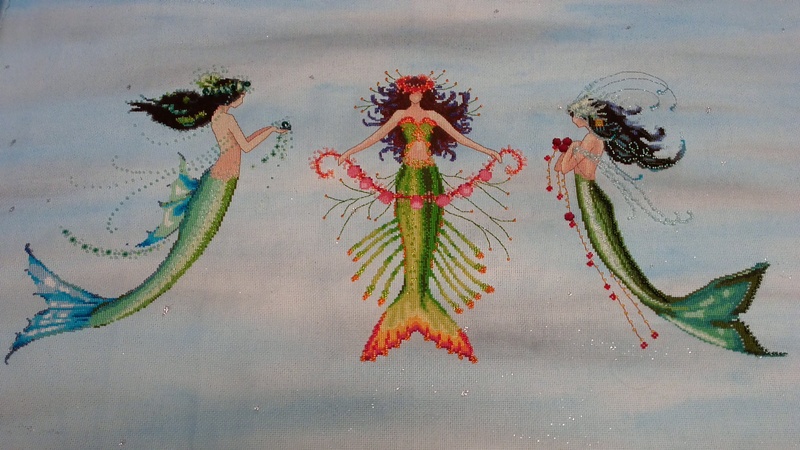 The 3 mermaids are all individual patterns by Nora Corbett. They are Mermaid Azure, Coral Charms and Mermaid Verde. I started this piece on August 28, 2015 and finished it on October 22, 2015. So it took me 8 weeks to stitch. And since I finished before my trip out of town over the weekend, hubby said we could stop by Stitches N Things and drop it off for framing. I chose a frame that is very similar to the frame used on Siren and the Shipwreck. I can’t wait to see it all framed up. A few fun things ended up on the counter while at the cross stitch store. More on that tomorrow. What are you working on finishing up these days? You really outdid yourself on this one Ginny. Fabulous job. What am I working on? Raven Queen….slowly. Thank you. This piece was a joy to stich. I am also back to working on Raven Queen and the last few nights working on her have been very slow for me, too. Wonder what is up with that? That is beauuuuuuuuuutiful! I had to click and look at it in detail and it is stunning. I love the glittery beading. You were very speedy on this! Thank you, Fawn. I was very dedicated to this piece. 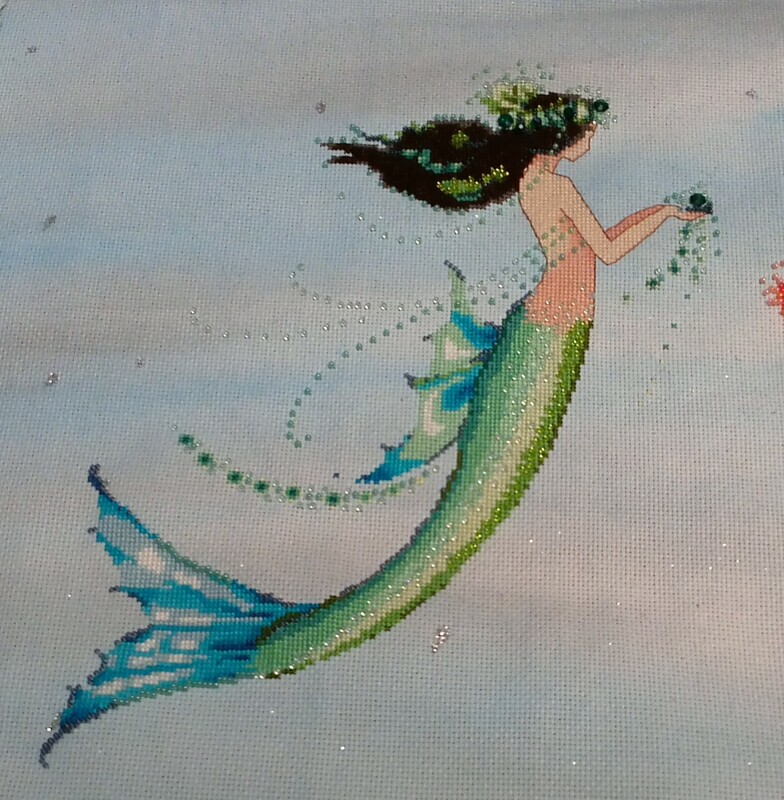 And since these mermaids are smaller, they were quicker to stitch. It is very sparkly and I can’t wait to get it back all framed up. Glad that I could enlarge the images to get a better look. They are so marvelous!! Thanks, Marsha. I can’t wait to get it back from the framer. They do look lovely! I have a couple of her letter mermaids, & this makes me think of grouping them. Thank you, Paula. Ooooo I think the letter mermaids would look wonderful grouped. I’d love to see what you come up with. Absolutely gorgeous. You are so good at this. I love to look at what you do and make, it is stunning. Thank you. You are so sweet. And I love to see what you are knitting. You make awesome socks. Something I have never tried. Good luck with your projects. I actually went to my LYS yesterday, only to get 2 skeins of yarn, and went home with a whole bag of yarn, including a gaint 400 g ball for a blanket. 🙂 I intend starting that soon and having it ready by next year winter. It is so very easy to get carried away with yarn. I very easily could have this last weekend at the shop I stopped at, but their yarns are so pricey. Can’t wait to see what you create with all of your new yarn. What a great idea to put 2 together. Thank you, Marilyn. There are actually 3 mermaids together. I also plan to do the other 3 La Petit mermaids in the same way. Right now I am back to stitching on Raven Queen and crocheting and knitting. Thank you, Diya. Though it was not my idea. I saw a guy on Facebook that stitched them together in 3 weeks! I immediately fell in love with it and knew I had to do it. I am so happy I stuck with it all the way through. Totally worth the effort. Turned out beautiful!! Thank you, Christine. I just received word this week that this piece is back from the framer and ready to be picked up. I hope to get out to the cross stitch store and pick it up next week. So exciting!